I survived all of my crazy travels [mostly] unscathed! I had a birthday, I slept on a boat in the gulf, I got all "New York" ballistic on a guy at 4am for being rude to some girls, and I hugged a bazillion people that I love. But that's a post for next time! Today I want to talk about my trip to Reef for Happy Hour with my friend Megan. (I also want to talk about how I MISS her because she LEFT ME to go teach English in Vietnam for the summer). But right before she left me to go teach English in Vietnam for the summer we decided to do Happy Hour at Reef! I was a little hesitant at first - It's a seafood restaurant, what could they possibly offer for vegetarians? I mean well first of all, I had to order the Million Dollar Mojito, because LIFE. And while it wasn't actually a million dollars (*Phew! *), it was AWESOME. If you're a mojito person, I definitely recommend this one. And I used to live in Miami, so I know a good 'jito when I drink one! 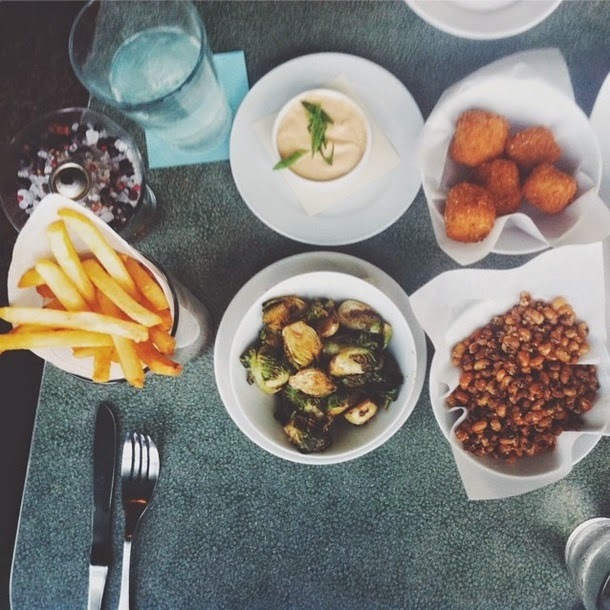 For our food, we ordered the black eyed pea popcorn, fried mac & cheese, and crispy fries with sriracha remoulade from the Happy Hour menu. We also ordered the ponzu glazed brussels sprouts from the regular menu. Before I get into each spectacular dish, I have to say that all of these items worked BEAUTIFULLY together. I seriously felt as though we were eating off of a tasting menu, and each one of the dishes was chosen by the chef - They flowed that perfectly. Probably the most unique thing we ordered was the black eyed pea popcorn. I don't know how else to describe them, other than they tasted like a classier version of corn nuts. They were crunchy, light, and not at all what I had expected (though I'm not sure what I expected from "black eyed pea popcorn"...)! And the french fries with sriracha remoulade? Yes, I will fall in love with every fry you put in front of me, but these were outstanding. Not at all soggy, but not too crispy, perfectly salted, and the remoulade was tangy and velvety, with a little kick. I was a total fan. And guys/gals, promise me one thing? You'll get these brussels sprouts. The caramel-y/sweet/salty ponzu sauce they were cooked in was fantastic. If any of you are not brussels sprouts fans, I'm willing to bet a cool seven dollars that these would change your mind. All of the dishes were phenomenal. But the rockstar of the evening? The crowned jewel? The Ryan Gosling of all appetizers? The fried mac & cheese OF COURSE. Megan had been to Reef before and was adamant that we order these, and with good reason. Fried mac & cheese is always a hit or miss thing with me (WHAT AM I EVEN SAYING). I find that they are often too rich and too large to be fully enjoyed. But these were absolutely magnificent. They were the perfect size, the cheese-to-breading ratio was spot on, they weren't too rich by any stretch, and if another human hadn't been sitting across the table from me, I absolutely would have housed all of them and asked for a second order. See, even though she leaves me for an extended period of time to go to the other side of the world, she keeps me in check. I cannot recommend Reef enough, especially for its inexpensive stellar happy hour. You'll sit in the colorful aquatic-like 3rd Bar area, sip on some phenomenal mojitos, and maybe you'll be the first two there because you're 29 going on 99, but I can promise you'll leave happy and satisfied! And only 18 more days until I get go to back with Megan!